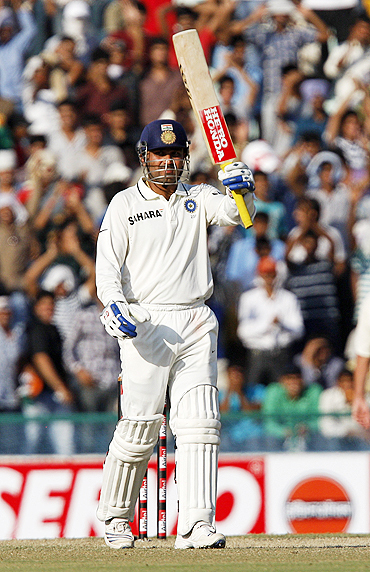 Rediff.com » Cricket » Will Sehwag's dismissal prove costly for India? 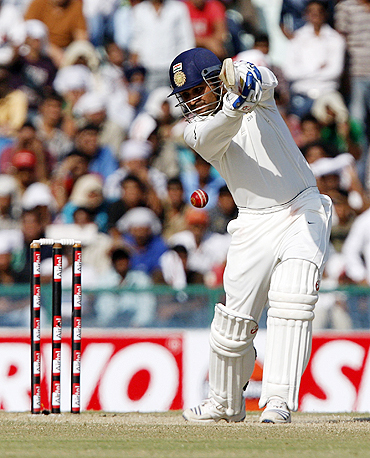 Will Sehwag's dismissal prove costly for India? He was considered the key to India's chances prior to the match. Virender Sehwag needs to fire for India to win the Mohali Test, they said. Only the fire didn't last long. 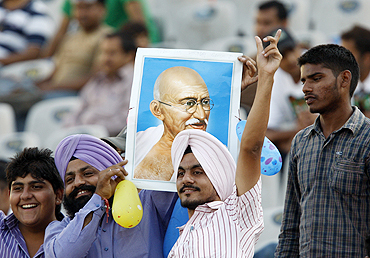 It was doused sooner than the Indian teams, and its restless fans, would have wanted to. And that in turn brought to the fore the question: Will Sehwag's earlier-than-expected dismissal decide the future course of the first Test? The opener, to his credit, started his innings with his usual belligerence. While he took turns to inflict suffering on Australia's two opening bowlers -- Ben Hilfenhaus and Doug Bollinger, he was ruthless against Nathan Hauritz right from the start. He scored his 23rd Test fifty (59), his eighth against the team from Down Under, in quick time (38 balls) and in doing so helped India to a solid start -- 81 runs partnership off 80 balls for the opening wicket with Gautam Gambhir (25). However, his dismissal -- by Mitchell Johnson, nine balls before close of play -- put the match back on an even keel. "It would have been nice to have Sehwag batting," said Harbhajan Singh after the day's play, adding, "It would then have been a different scenario tomorrow." "The wicket of Sehwag might just have swung the game in our direction," said a confident-looking Tim Paine, adding, "though we would still like to believe the match is still evenly poised." Harbhajan was quick to point out that the game is far from over. "We have a lot of other batsmen," he said, rattling off the list of names we all know before adding his own to it. "At the moment the game is evenly poised," he added. However, there was a word of caution. "We need to bat well tomorrow and get as close to their total as possible," he said. "Then, in the second innings, we can try and restrict them and then chase down the total." Harbhajan's logic had twin basis. Firstly, the manner in which Australia batted "given the conditions, when the ball wasn't coming to the bat". And, secondly, the fact that the wicket had offered no help to the bowlers yet. "Bowlers have had to toil hard, as the wicket is offering no help whatsoever," said Harbhajan, adding, "There is no pace or bounce. Neither is there any spin off the wicket." "The only thing you can try and do is beat the batsman in the air. Maybe things will improve in the last two days," Harbhajan stated. Whether things go India's way in the days ahead remains to be seen. However, at stumps on day two, the visitors might just be forgiven for patting themselves on the back. For, having accounted for Sehwag, they have ensured a batsman who could have changed the course of the match altogether -- the ground conditions notwithstanding -- had he continued for a little longer, can only watch the proceedings from the dressing room come day three. And that may well prove to be a crucial factor, one that can change the course of the Test.